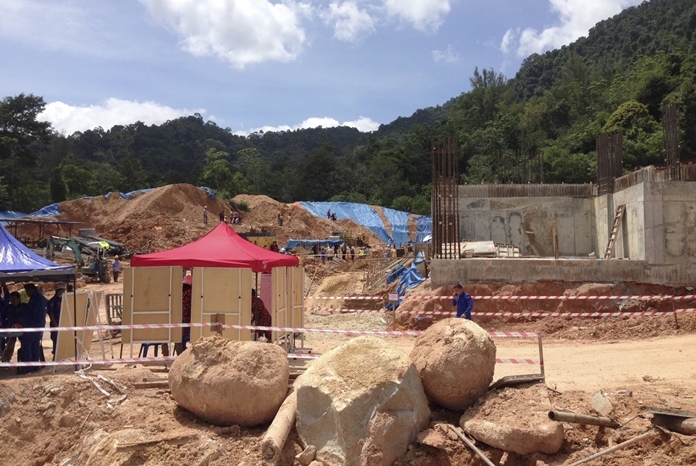 Kuala Lumpur, Malaysia (AP) — A landslide at a construction site in northern Malaysia on Saturday killed three foreign workers, with rescuers searching for 11 others feared trapped in the mud and rubble, officials said. Fire and rescue official Mohamad Rizuan Ramli said a 10-meter (33-feet) -high slope crashed down at the construction site in northern Penang state, a popular tourist destination, early Saturday. He said the bodies of two Indonesians and an unidentified foreigner have been recovered. Rescuers are racing against time to excavate the rubble to get to another 11 foreign workers, believed to be from Indonesia, Myanmar and Bangladesh, who are feared buried alive, he said. Bangladeshi worker Mohammad Jashim Hussein Ahmad told the national Bernama news agency that the landslide happened swiftly without warning and was over in just a minute, burying his friends, who had no time to run. State lawmaker Teh Yee Cheu told local media that he was told by a rescue worker that most of the victims were likely buried at least 10-15 feet under mud and rubble. He said natural boulders from the hill had also come hurtling down during the landslide. He said the victims included a Malaysian, who is the supervisor. Penang city Mayor Maimunah Mohamad Sharif said weather on the island was dry and the cause of the landslide wasn’t clear.